Continuing my previous post, I will argue that one reason, as Tyler Chadwick states it, for "the insistence on measuring [Mormon art] against the standards of Mormon culture/theology [and] against the letter of God's laws" is that this approach attempts to create a culture legalistically where none of substance actually exists. My case study in this analysis is the NHK Asadora series Dan Dan, a culturally "localized" version of The Parent Trap that not only puts this old plot in a whole new cultural light, but adds additional layers of its own. In particular, Nozomi's life as a maiko is as unique to her twin sister Megumi (and most Japanese) as it is to me. I worked similar "cultural singularities" into The Path of Dreams by incorporating "temple culture" (though editorially cleansed of explicit references that could illuminate that culture more fully for non-Mormons, but which Mormons consider heretical), polygamy, the returned-missionary subculture, conservative mores, and Utah history. But you can push the polygamy/Utah history/RMs/conservative mores thing only so far. In Angel Falling Softly, the conflict between works and grace and giving the devil his due are not unique to Mormonism, and most of the "peculiarities" arise out of social, not religious, culture of a type that could be found in, say, Lake Wobegon. As my sister Kate puts it, "a large part of Mormon culture is expectation-oriented rather than gospel-oriented." To be sure, seeking out people with similar expectations can be very entertaining, but meeting expectations as a matter of course isn't very revealing. Rather than creating or adding to a culture, doing so only freezes it in amber. And if the ultimate goal is to "blend in" with mainstream Christianity, then Mormonism loses the ability to contribute a unique perspective to the human comedy beyond those expectations. As with Vanilla Sky, why remake the original (Abre Los Ojos) if it adds nothing meaningful or new except a bigger budget and a famous actor? Is the story exploiting quirks in the culture to set itself apart? Is it reflecting the culture in order to say something important about it? Or rather, is there a culture there substantial enough to have important things said about it? As things stand right now, I'm pessimistic about "Mormon culture" reaching meaningfully beyond "Utah culture." To be sure, "Utah culture" has a lot going for it, starting with the Mormon migration, polygamy, the ethos of the American West, and all those unwittingly multicultural and reluctantly virginal returned missionaries. But like Shinto, these cultural singularities are inextricably bound to geography and demographics. I must emphasize that this isn't a bad thing. Tony Hillerman created a whole literary world in the Four Corners area of Southern Utah and Northern Arizona just telling stories about the Navajo Tribal Police. Faulkner did the same with his fictional Yoknapatawpha County, approaching the infinite by looking very carefully at the minute. Speaking of Shinto, Miyazaki's Princess Mononoke and Spirited Away have entertained and inspired audiences far beyond Japan's borders, as have Shinto-inspired anime series such as Inuyasha and Kamichu! But as Jean-Marie Bouissou observes, "the very idea of a [non-Japanese] Shintoist would strike the Japanese as absurd." Instead, I'm talking here specifically about a religious culture with catholic aspirations that must reach beyond the confines of the Wasatch Front, and in its success cease to be an anthropological curiosity. It must draw universally-recognized lines in the existential sand and defend them. My alternate-universe solution? For starters, Mormon marriages would thus become "public"--to the extent that non-Mormons would be invited, and photographs of Mormon weddings would become distinguishable from those of the generic Christian ceremony. Second, the "low church" needs something akin to a Bar and Bat Mitzvah (as opposed to Eagle Scouthood) and a Mormon version of the butsudan, which would fit nicely with the whole genealogy business. Third, the church would forcefully declare itself to NOT be a Nicene sect, and to be thoroughly uninterested in the theological approval of the Nicene community, thus divorcing the "Mother Church" and creating a huge, unavoidable and unbridgeable rift in its place. No true ideology, religion or culture compromises itself with glad-handing. Of course, I'm speaking from authorial self-interest. Conflict, not uniformity, makes for good fiction. Literarily, I want to pick fights, not play well with others. The following ties into two posts at A Motley Vision, "The Tragic Tell of Mormon Morality" by Tyler Chadwick and "LDS fiction, Mormon fiction" by William Morris. Specifically, supplementing Karl Keller's reasons for "Mormonism's lack or denial of a serious literary heritage": the lack of a uniquely identifiable culture. As previously noted, my favorite television program right now is the NHK serial drama, Dan Dan. It's an extended (to cover a season's worth of plot) Japanese version of The Parent Trap, about twins separated at birth who discover each other on their eighteenth birthday. Watching Dan Dan prompts me to think about how culture can accentuate "the same only different." I think a major selling point of anime and manga, for example, is experiencing familiar stories couched in unfamiliar settings that bring out unexpected, undiscovered aspects of the narrative. The "big C" culture aspects in Dan Dan are obvious. One sister (Nozomi) is a maiko (apprentice geisha), living in Kyoto's Gion district. The dialect spoken by the Gion geisha is such that when playing Nozomi, Megumi has to stick to "Yes," "No," and "Thank you" to avoid giving herself away. Japanese concepts of family duty and honor are leveraged to an extent that would still surprise American viewers. Screenwriters can have grandparents living with their children as a matter of course, and when Japanese apologize for really screwing up, they will kowtow. The visceral impact of this gesture cannot be underestimated. Legal differences. When Megumi first suspects that her mother might be her stepmother, she only has to pay a small fee and get a copy of her koseki birth certificate (which records maternity and paternity) at the local government office. Plot developments delayed in the American version are brought immediately to the fore. Comparing the 1998 Disney version (which I quite like) with Dan Dan also brings to mind the differences between The Seven Samurai and The Magnificent Seven. The latter is not just a "remake" of the former, but an entire reimagining within the mythos of the American West. Ditto Yojimbo and A Fistful of Dollars. But the Bruce Willis remake (Last Man Standing) is little more than a pale copy with the actors and sets changed. All Last Man Standing inspires in you is an appreciation for what Leone and Eastwood did with A Fistful of Dollars. The point I'm getting at is summed up in a Bruce Jorgensen quote William Morris links to: "Maybe Mormonism itself has no 'essence' but only a story." I would clarify that it has no cultural essence. Namely, I'm hard pressed to imagine how an explicitly "Mormon" context would introduce that much of a difference here. Ironically (because the church now disavows it), rich possibilities could be found in a polygamous setting. Otherwise, the dramatic "essence" contributed by a Mormon setting would be too subtle to detect. Are the unique cultural elements of Big Love (for example) the only kind recognized as such by non-Mormons? I'm not a big fan of television soaps, day or night. I watched the first season of 24, but I just don't like being dragged along from cliffhanger to cliffhanger, so I've avoided it since. I generally avoid sneak previews for the same reason. One exception to the rule is NHK's Asadora or "morning (asa) drama (dorama)," except that watching on satellite in the U.S. means it's on at night. It belongs to the renzoku terebi shousetsu genre, or "ongoing television novel." An Asadora features a spunky female lead confronting personal, family and romantic conflicts. The story takes place in a distinct setting. Each episode is fifteen minutes long, broadcast Sunday/Monday through Friday/Saturday. New series start in April and October, last six months, and come to a conclusion. Every week's worth of episodes is a "chapter," and each chapter adds to the narrative arc of the entire series. Subtracting opening and closing credits leaves 75 minutes or so for each chapter in six acts, including the teaser for the next weeks' chapter. It's fascinating to see the skeleton of a television drama so plainly exposed. You can watch the plot turns coming down Fifth Avenue. But that doesn't detract from the fun. Granted, some stories work better than others and some casts have better chemistry than others. Conventional romances fare the worst. As Erica Friedman archly observes, "I can clearly remember a J-Drama I watched for weeks and weeks and when the lead male and female finally got together . . . the kiss sucked the romance right out of my house." That's been true of every Asadora series I've watched. NHK's writers are much better at family dramas with a strong sense of community and tradition (of which Japan has heaps): everybody related to everybody else, with lots of nosey relatives and neighbors. Although romantic subplots were hinted at in Hitomi (2008), the story thankfully never went there. Instead, it focused on the estranged relationship between Hitomi's mother and grandfather, and between her mother and father, who divorced when she was a child. Hitomi's grandfather is a foster parent. Some of the most interesting episodes were about Japan's foster care system. And both Hitomi and Dan Dan have worked in themes about Japan's aging population (this educational aspect is also common; hey, it's NHK). As noted above, an Asadora series draws attention to a geographical area. Hitomi takes place in the shitamachi neighborhood of the famous Tsukiji Fish Market, exploring the idiosyncratic lives of the people who work there and the history and customs particular to it. The most recent series is Dan Dan, starring identical twins Mana and Kana Mikura. It begins with the plot device straight out of The Parent Trap, about twins separated at birth whose paths cross on their eighteen birthday. 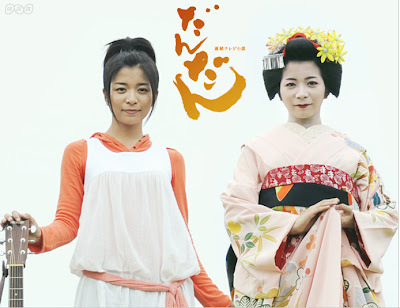 The one sister aspires to become a folk-rock singer, the other is a maiko (apprentice geisha). The story takes place in Kyoto and scenic Matsue in western Japan. Watching the twins delve into the mystery of their separation is as entertaining as the best whodunit. As you can see, the first time Nozomi and Megumi meet, Nozomi is heavily made up, which conveniently hides their similiarities, and Nozomi lies about her birthday just to drag out the suspense a few more episodes. Up to the point they switch roles, we've only seen Nozomi in a kimono, with her hair done up in the momoware ("split peach") style. So when she changes into Megumi's jeans and T-shirt and literally lets her hair down, you really do lose track of who's who. "Blue laws" originated during the Colonial period of American history, referring to laws intended to enforce the Fourth Commandment. I'm old enough to remember blue laws still being occasionally enforced in upstate New York, even in the wake of the 1962 Engel v. Vitale decision. In Utah, state liquor stores are closed on Sundays. Aside from those governing alcohol, there are few explicitly religious regulations. However, some local Utah governments have skirted with the appearance if not the fact by closing municipal swimming pools on Sunday. In the case of Provo, it was argued that they were closed for lack of use, an argument that paradoxically makes sense considering that the city closed the municipal swimming pool but not the golf course, a clear indication of the priorities of Sabbath-breaking Mormons. In any case, it must be said that laws governing the consumption of tobacco and trans-fats and the like are proving just as puritanical as the blue laws originally enacted by the real Puritans. Roku is the streaming video service being pushed by Netflix. Right now, it only streams in real time, which strikes me as the worst solution. It should work the same way the Netflix queue works: you add movies to the queue and then Netflix trickles the data to a hard disk in the box. Until a large proportion of the population has consistent, 10 megabit Internet access (fiber to the home), this scheme won't even guarantee ordinary DVD video quality, let alone HD. Anyway, what caught my attention about it is that somebody at the company must know Japanese, because roku (録) means "to record," as in rokuga (録画), meaning "video recording." Except that this "Roku" doesn't do that. Yet. It's rare that science fiction actually predicts the future. Sure, the first Star Trek series got the cell phone right. But especially on social issues, most plots are about the here and now. This is not a bad thing, as science fiction and fantasy settings provide an aesthetic distance that gives freer range to the arguments being made. One in a while, though, an artist sees the future so clearly that you can believe time machines exist. Namely, the British newspaper The Telegraph recently quoted "medical ethics expert Baroness Warnock" saying, "If you're demented, you're wasting people's lives--your family's lives--and you're wasting the resources of the National Health Service." Now watch Ghost in the Shell: Solid State Society. It covers the same issues and their implications brilliantly. Referring to the "Noble Rot Senior Citizens" (to translate the Japanese literally), in his grandiose, ends-justify-the-means soliloquy, the villain in the movie practically quotes Lady Warnock verbatim. Two years ago, Kenji Kamiyama saw the future. Okay, he only saw two years into the future, but do that on a predictable basis and you'd be richer and wiser than Warren Buffet. I don't fear the kind of revenge exacted on behalf of Kamiyama's senior citizens against their Lady Warnocks ever becoming a reality, but I wouldn't be surprised by something metaphorically akin to it. In any case, I do expect to see this battle between the "haves" and the "want-to-haves" looming up in our rearview mirrors very soon. To be sure, I'm not too worried, as I happen to be just old enough (a very late baby-boomer) to anticipate getting grandfathered into whatever soak-the-younger-generation scheme gets conjured up in the name of compassionately "sharing the wealth," just before the whole system goes broke. The Relief Society is the official women's auxiliary of the Mormon church. Steve Young married former model Barbara Graham March 14, 2000 at the age of 38. The story in the defunct Mormons Today begins, "It actually happened. Mormonism's most eligible bachelor, Steve Young, was married yesterday." Gyouten (暁天) is the capital of the Kingdom of Kei. This topic came up over on the LDS Writers Blogck blog, so as a service to other paranoids like myself whose living very much depends on all those bits being safely stored inside their computers, I'll post my recommendations here as well. First of all, if you have a reasonably fast Internet connection, you should definitely install Mozy. The first 2 GB are free, and at least for me, everything in My Documents (except for My Music) takes up less space than that. Once Mozy is set up, it keeps your hard drive busy for several hours while it images your files. After that, it only saves the "delta" (files you've changed). It's fast and transparent (it can be instructed to make backups when the computer is idle), and has never given me a lick of trouble. With the "free" plan, you only pay if you have to restore more than one file a month. I think of it as fire insurance. Another free Internet service is Box. Unlike Mozy, you treat Box like an ordinary external hard drive. The free plan offers 1 GB of storage with a 10 MB individual file limit. In a pinch, you can email files (as attachments) to your Google or Yahoo email account. I also image my entire hard drive every six months or so using the ThinkVantage Rescue & Recovery software that came with my ThinkPad and an external USB hard drive (a similar product is Norton Ghost). Plus, I make critical backups (that I can immediately access) to a couple of USB flash drives. The epigram for this chapter is by Cervantes. The adjective "ophidian" refers to the biological order serpentes. I believe the snake fang is much better suited for explicating vampire biology, specifically solenoglyphous snakes such as rattlesnakes, cottonmouths and copperheads, whose long, hollow, venom-bearing fangs fold back against the roof of the mouth. For eleven straight years, the Princeton Review has voted Brigham Young University the "No. 1 Stone-Cold Sober University" in the country. Hence Milada's interest in the University of Utah instead. The football rivalry between BYU and the University of Utah stands at 49-30-4 (or 52-33-4, if you include Brigham Young Academy), with Utah ahead. The basketball rivalry also slightly favors Utah at 124 wins versus 120 for BYU. The bunbou shihou (文房四宝) are the "four treasures of stationery": inkstone, brush, paper and ink. Not long ago an editor told me she'd discovered that the Sony Reader was so perfectly suited to reviewing manuscript submissions that her boss purchased them for everyone on the division's editorial staff. She simply uploads manuscript files and reads the book at home or on her commute to and from work. Recently I have heard many an editor rave about the virtues of the Sony (and to a lesser extent Amazon's Kindle) as an editorial tool. They also speak of the "green" benefits of paperless transmission of texts. Authors and agents benefit too, thanks to savings on photocopy, printing, and mailing costs. Curtis also points out an unexpected difficulty with using Word to review drafts (the intrusiveness of the spell and grammar check functions), and discusses the evolving experience of reading as it becomes more and more dominated by electronic media. A mixed but mostly positive review of Angel Falling Softly in the most recent Salt Lake Tribune entertainment supplement, In Utah This Week. What is surprising is that Woodbury is also able to write convincingly from the point of view of a worldly vampire whose experiences are decidedly more carnal than that of any Latter-day Saint . . . . Woodbury did well to make [bishop's wife, Rachel] not too much of a stereotype . . . [and he] does a good job of letting us inside the minds of these two women. The reviewer's main criticism is that the "novel comes off feeling more like a novella" that left her "longing for more complexity, more depth, and a fuller picture of the characters' lives." Point taken, though I'm reminded of Michael Blowhard's arguments here and here that perhaps the novella format is what fiction needs to stay alive. "What an odd taste [novel reading] is," he observes, "staring at oceans of text, dutifully trudging from one page to the next." The "swamp cooler" is more technically defined as an "evaporative cooler." It cools the air by forcing air through a water-soaked filter, producing cool, humid air (hence the term "swamp"). Swamp coolers only work well if the summer dew point is consistently below 60. They're inexpensive, low-tech, much lower-power than conventional air conditioners. But they use water in an arid climate (not a lot, but constantly), and being exposed year-round to the elements, tend to spring leaks. Because the Great Basin is predominantly high-altitude desert (Sandy has an elevation of 4,450 feet), even during the summer the temperature can fall from over 90 degree during the day to below 70 degrees at night, so any kind of whole-house ventilation can quickly cool things down. The expression Sei uses at the end of the chapter is 「月に乗じる 」(tsuki ni joujiru): "take advantage of the moon[light]." The title of the story is derived from the on'yomi of the two kanji: 乗月 or jougetsu. On October 1, 2008, Japanese manufacturing giant Matsushita Electric officially retired both its corporate name and the National brand and brought all of its product lines under the Panasonic label. The Matsushita and National brands had previously been used--mostly in Japan--for industrial parts and equipment in the former case and kitchen appliances in the latter (called shiromono in Japanese, or "white goods"). The National/Panasonic distinction remains pretty fixed in my mind. My little National rice cooker (white enamel finish, natch) is a quarter century old and still works fine. I have a Panasonic VCR and DVD player. At least for the time being, it's weird to see "Panasonic" on a toaster or refrigerator. I expect there to be a radio in it or something. Then again, computerized toilets are big in Japan, so maybe it's not that big a reach. After surveying the plummeting birth rates in Western Europe, the irascible Spengler of the Asian Times quipped back in 2004, "The Greens hector us about the end of the world. Perhaps it is not the end of the world, but just the end of you." That metaphor sprang to mind reading Kassia Krozser's reply to Boris Kachka's bibliophilic business obituary, "The End." What he really means by that, opines Krozser, is not the end of us, but the end of you, the "literary (with a capital L) fiction" crowd. Out here in the real world, readers decide what they want, and, man, they want a lot of stuff . . . . There was never a Golden Age of Publishing when people bought only high-brow fiction that elevated the mind. Observing Kachka's sympathies for editors at the New York publishing houses who didn't flock there "because they want to publish Danielle Steel," Krozser snaps back, "Don't insult the readers. You really, really need people to buy your books." That doesn't only mean publishing books that people want to read, but also making them available in the most accessible forms possible. The lessons from history are clear: though it originally fought the VCR tooth and nail, digitizing its backlist saved Hollywood. And on more than one occasion, the new technology has come to the rescue of the old. It took a while for the new business model to prove itself, but then Netflix did it, and it was heavyweight Blockbuster scrambling to catch up. Many publishers apparently think Blockbuster was right to dawdle and the record labels should have stuck with the LP. I'm as much a fan of the traditional book as the next guy (what Seth Godin calls "souvenirs"), but bibliophiles rhapsodizing about pressed wood pulp and offset printing reminds me exactly of audiophiles going on and on about the superiority of vinyl and turntables. Fine, if you insist, and to each his own. Just don't take the whole industry down in order to protect your preferred niche. Yet at the same time that publishers are whining about the decline of the literary novel, Krozser ironically observes, the industry "relies on mega-hits to justify its existence." I can confirm that blockbusters are indeed great when you happen to have one. The problem is that neither we nor anyone else can predict what will be a blockbuster or how to create them with any regularity. Also via Chris Anderson, David Heinemeier Hansson brilliantly explains the problem with this "bet-the-house" approach. Although he is talking about software development, his observations and conclusions apply equally well to the publishing world.